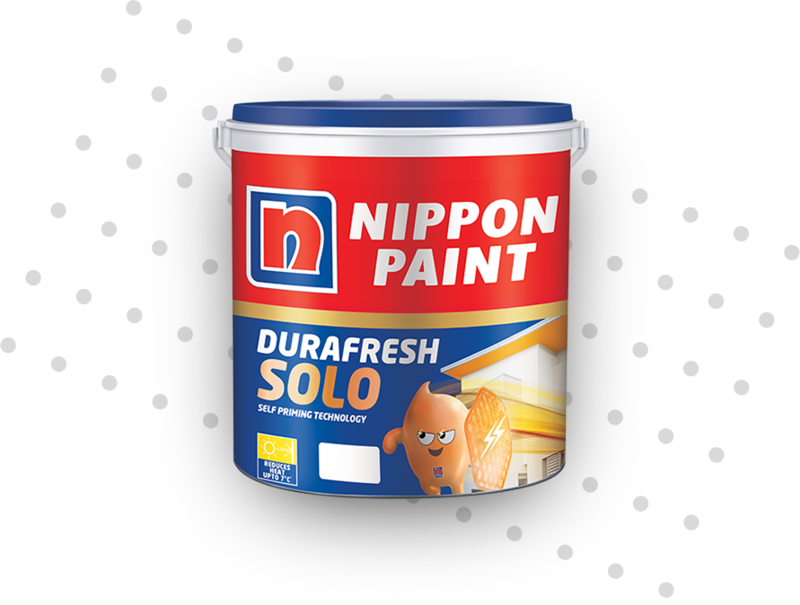 Nippon Paint Durafresh Solo is a specially formulated Self-Priming Exterior Emulsion paint having systematic UV crosslinking mechanism exhibiting Excellent balance of flexibility and dirt pick-up resistance. It exhibits Heat Ban technology which reduces surface temperature by up to 7°C. It imparts a rich sheen finish and has anti-algal resistance to keep your walls fresh for longer time. It doesn’t allow dirt/dust to settle on walls. The innovative Heat Ban technology reflects back 90 % of the sunrays which reduces surface temperature by up to 7°C. It does not emit air polluting harmful vapours and paint odour that pollutes our environment. Exteriors look new and beautiful for years. This makes the interior cooler, thus helping to save energy used for airconditioning. Environment friendly and Healthy paint.